Black people spend most of their time leeching off the government, shooting each other and aborting their children before they're born. The few that do survive only do so by contributing to society like normal people--like white people. Honestly, they're better off shooting each other to death or aborting themselves because they don't seem to care to thrive. This is not an uncommon perspective. I've heard a number of people express exasperation over the violence in the black community. 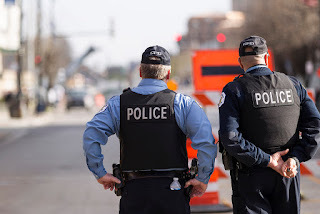 Especially living near Chicago, the reports of gang activity elicit anger over what they're doing to our country leading many to callously say that we should let them kill each other. It's a very different response than many have towards white school shooters. Unlike black folks, these poor people have a mental illness. Similarly, those who oppose abortion are quick to say of white, pregnant teenagers that they need society's support. Rather than dismiss them as getting what they deserve for the choices they make, antidepressants are dispensed like candy and crisis pregnancy centers are spared no expense. In other words, white lives matter and black lives do not. It cannot be ignored that given similar situations and circumstances, black people somehow deserve less than their white counterparts. That's why we need the Black Lives Matter movement. Because many people in this country act as though black lives don't matter as much as white lives. Black Lives Matter is a response to inequity, not a cheap liberal attempt at reparations. Just like how Black History Month corrects a significant imbalance in our nation's education, Black Lives Matter exists to correct an obvious imbalance in our perception of the value of human life. Blue Lives Matter does nothing of the sort because there is no imbalance. Cops might be slandered for loving donuts, but their choice to put their lives on the line every single day is almost never criticized. Yet somehow holding them accountable to enforcing the law without a well-established societal prejudice is perceived as an imbalance. No, I'm not equating a life of crime with a life of crime fighting. First of all, the fact that white criminals matter more than black criminals in our society makes my point all by itself. Secondly, there's something severely wrong with valuing life based on choices. All life matters because God created it and God values it. Cops' lives don't matter more than criminals any more than whites matter more than blacks. God loves them all and he's called us to do the same. Saying that criminals, regardless of color, make their own bed and get what they deserve is despicable. Only the ungodly celebrate death because true Christians mourn the loss of any soul. So does that mean we should scrap both Black Lives Matter and Blue Lives Matter for the completely equal All Lives Matter? No. Hopefully for the last time, Black Lives Matter is not about being equal but rather creating equality where there is none. Blue Lives Matter, however, thinks it's about being equal even though there's nothing equal about how they think about black people. But that's what happens when you treat an unequal situation with equality: you get more inequality. And that's why Blue Lives Matter seriously needs to stop mattering.